Today, the Williams Institute released a landmark report that investigates the economic implications of LGBT discrimination—and the costs are high. The report makes the case that “stigma and discrimination have been linked to negative economic impacts on governments, businesses, and the economy,” and looks at three criteria: discrimination in employment and other settings; bullying and family rejection of youth; and health disparities experienced by LGBT people. According to the report, employment discrimination against LGBT people could cost Georgia taxpayers $1,048,000 in state Medicaid expenditures. Individual public and private employers stand to lose $9,100 per employee that leaves the state or changes jobs because of workplace discrimination. These figures do not include the immeasurable cost of decreased productivity in an employee experiencing stigma and discrimination on the job; or in a manager whose time is consumed by hiring due to difficulties in recruitment and low employee retention rates. With nearly 1 in 4 LGBT respondents of a 2011 Phillip Rush Center survey reporting workplace discrimination, and nearly 1 in 2 (45%) reporting harassment on the job, rates of unemployment and underemployement are also high among this population. This can lead to a loss of housing, which ultimately costs taxpayers nearly $500,000 every year in public funding to homeless shelters. 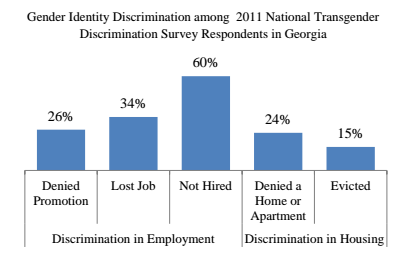 Rates of discrimination increase exponentially among Georgia’s transgender population, with 80% of respondents to a 2011 National Transgender Discrimination Survey reporting experiencing harassment or mistreatment at work. Twenty three percent (23%) of transgender respondents reported experiencing homelessness versus 6% of respondents to the LGBT survey. 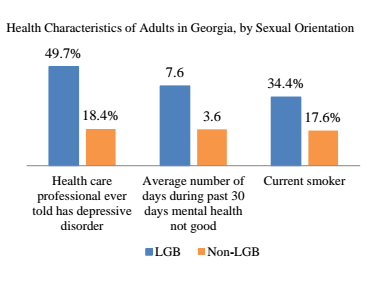 The Williams Institute also reports that stigma and discrimination put gay and transgender Georgians at higher risk for major depressive disorders and smoking. As a direct result of these health disparities, Georgia’s economy could be losing an additional $255.9 million each year on skyrocketing healthcare costs. These numbers are dramatic. 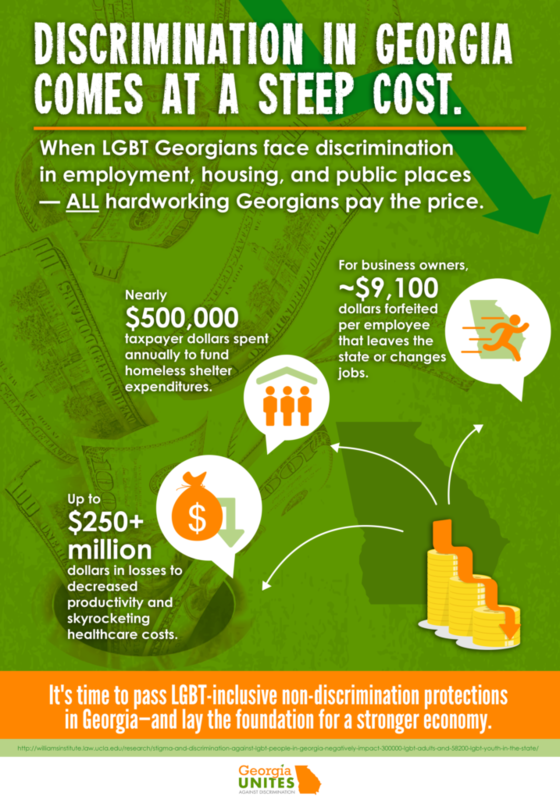 All told, Georgia is losing hundreds of millions of dollars per year because of LGBT discrimination. Right now, Georgia ranks 38th in the nation on public support for LGBT rights and acceptance of LGBT people. And our state has some of the most lax non-discrimination laws in the country—with no explicit protections at the state level. With more than 300,000 LGBT adults and 58,200 LGBT youth living in Georgia, it’s time that we start taking steps to ensure this population is protected from discrimination and start building the foundation for a stronger economic future. Non-discrimination legislation would help reduce rates of stigma and discrimination against LGBT Georgians, increase overall economic productivity, and reduce avoidable expenditures on healthcare and other public programs. This solution is good for ALL Georgians. You can read the Williams Institute’s full report here.